The Schleppr turns an unhandy sixpack of PET bottles into a convenient and stylish shoulder bag. The Schleppr has a simple, but ingenious design and is easy to use. The Schleppr is extremely versatile. It does carry all PET sixpacks, washing powder boxes, packages, beverage crates and other bulky stuff. It can even be used as a emergency dog lead. 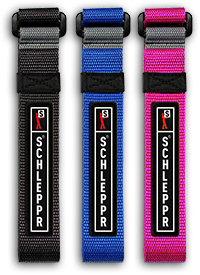 The Schleppr is made in Schanzenviertel, Hamburg, Germany.